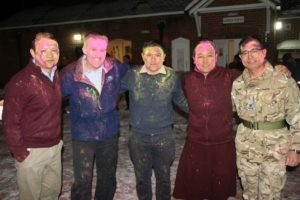 Holi (Festival of Colour) with our new Trainee Gurkhas. Gurkha Company Infantry Training Centre Catterick observed the Hindu festival of Holi (Festival of Colour) on Thursday 1st March 2018. All 270 new trainees from Recruit Intake 18 and Permanent Staff including the Commanding Officer 2 Infantry Training Battalion and his family attended the celebration. Find out more on our blog page that is following the trainees progress.